It was a simpler time in the late 1940s, especially in South Georgia and specifically in a sleepy little town called Second Samuel. What had been called the Great Depression was quickly fading into memory. The war had been won, the election was now over, and "Give 'em Hell Harry" was still president. It had been an exciting time for sure, but the folks in Second Samuel were ready for things to settle down and get back to normal. Except...this was the summer Miss Gertrude passed away, and deep dark secrets were about to be revealed. Nobody could have imagined how the death of one sweet little old lady would turn the entire town upside down, leaving everybody in Second Samuel wondering if anything would ever be normal again! Limited tickets available for a post-show reception with playwright, Pamela Parker, on Sunday, October 9th. 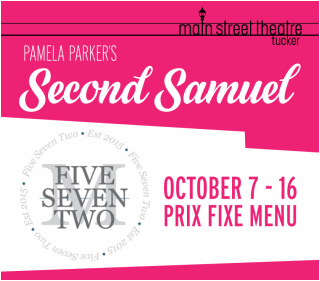 Main Street Theatre is proud to partner with local restaurant M572 for a special "Second Samuel" menu for our patrons. Click here for more details.